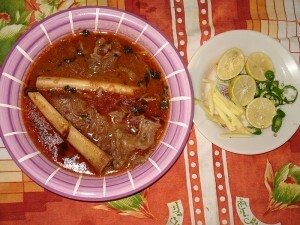 Hot N Spicy Nihari recipe by Nazia at PakiRecipes.com. Heat ghee and fry ginger /garlic . Add meat piece along with chili powder, salt and nihari masala and fry well by sprinkling little water. Add in nali and 10-12 cups hot water, cover and let it cook for an hour. Sift flour and Atta together and make into a paste with water and add to the meat. Cook on very low fire for atleast 2-3 hours. Serve with finely sliced ginger , chopped green chillies, lemon, coriander leaves and tandoori Nan.